Everyone in Acadiana knows that feeling of crawfish anticipation in the air. Right around Thanksgiving, it starts as whispers about price per pound, how the weather is affecting the harvest and, most importantly, when your favorite joint will open for business. As the season grows, so do the crawfish. Tiny tails beget giant clawed monsters, so big you can almost count the number in a five-pound order on two hands. Megan Arceneaux’s entire life has been intertwined with this annual tidal wave of Cajun hunger. She is the daughter of Anthony Arceneaux who founded Hawk’s, a crawfish restaurant in Rayne, with his own father in 1983. In 2007, Megan found the inspiration to throw her own boils and began a tradition of parties at her house and bike shop (Hub City Cycles) that eventually turned into a full-on catering business. In 2015, she founded an offshoot of the family business called Hawk’s Boil Up, a mobile version of the same flavors and massive, purged, beautiful crawfish crop that her family serves. It didn’t take long for the people of South Louisiana to catch on. Now she is boiling all over the state for her growing roster of fans and celebrity clients. During the season, she has a regular gig boiling at the Wurst Beer Garden two days a week in downtown Lafayette. Always up for a good party, Megan agreed to help design an end of season backyard boil bash with crawfish so delicious they would be fondly remembered all the way into next season. Honestly, the stunning red creatures alone would have probably been enough, but we decided to up the ante by enlisting the talents of Ryan Trahan, the newly appointed head chef at Blue Dog Café. Trahan is another rice and crawfish country kid brought up around the restaurant business. His family owns the legendary Frosto Drive-In located in downtown Crowley. Currently, in his roll as chef at Blue Dog, he is helping to restructure the longtime Lafayette concept by writing a new menu and bringing some of his fine dining chops and creativity from his previous project Dark Roux. Trahan was hired by the Rodrigue family to help them honor the legacy of their father George Rodrigue and his famous Blue Dog paintings. Toast: Preheat oven to 350 F. Slice 2 10-inch French bread loaves into ½-inch thick slices and brush both sides of each slice with ½ cup butter (melted). Lay toast flat on a baking sheet and bake in the oven for 6-8 minutes or until golden brown, flipping the toast halfway through. Remove from the oven to cool. Once cooled store in an airtight container until ready to serve. Jalapeno Garlic Spread: Heat oven to 450 degrees. Remove tops and seeds from 2 jalapenos and toss in a teaspoon of olive oil. Roast in the oven for 7 minutes until soft and slight char starts to form on the skin. Remove from the oven. Place 1½ pound of cream cheese, 1 tablespoon of roasted garlic, ¼ cup of olive oil and ½ teaspoon of salt into the base of a food processor and process until smooth, about 3-4 minutes. Finished product should be smooth and spreadable. BBQ Pork Tenderloin: Light the grill. Rinse 1½-to 2-pound pork tenderloin under cold water and pat completely dry. Rub ¼ cup Paul Prudhomme’s Magic Barbecue Seasoning over the tenderloin to coat. Allow to rest at room temperature for 45 minutes. Grill tenderloin to 145 F, flipping halfway through. Only flip once to ensure that the seasoning has ample time to blacken on the outside and a nice crust forms. Remove the tenderloin from the grill, coat in 1 cup pepper jelly (make your own or purchase your favorite). Allow to rest for 15 minutes. Slice the tenderloin thinly, and coat with the juices and jelly drippings from the resting pan. Jalapeno Slaw: Combine juice and zest of 3 limes, ¼ cup of olive oil, ½ cup of shredded green cabbage, ½ cup shredded purple cabbage, ½ cup of shredded carrot, ¼ cup of seeded & julienned jalapenos, ¼ cup of julienned green onion, ¼ cup cilantro (picked from stems), ¼ cup parsley, salt and black pepper to taste into a mixing bowl. Mix slaw thoroughly and marinate for 20 minutes before serving. Assembly: To assemble spread 1 tablespoon of jalapeno garlic spread onto each toast point. Place one slice of pork loin and a spoon full of slaw on top. Repeat until all toast points are dressed. Arrange onto a serving platter and serve immediately. Bun Dough: Heat 1⅓ whole cup milk to 100 F on stovetop. Place 1½ tablespoon yeast and 1 cup sugar in bowl of stand mixer fitted with the dough hook attachment. Pour the warm milk into the bowl. Cover with a towel and let sit until the yeast is foamy, about 5-10 minutes. On low speed, beat in ½ cup softened butter until it is slightly broken up. Next add 2 large eggs one at a time until incorporated. In a medium sized mixing bowl combine 4 ⅔ cup all-purpose flour and ½ teaspoon salt until well mixed. On low speed, gradually add flour mixture to mixing stand bowl. Beat on medium speed until dough forms. Increase speed to medium-high and beat until the dough is soft and smooth, about 8-10 minutes longer. Transfer the dough to a lightly floured surface and form into a ball. Place in a lightly greased bowl, cover loosely with plastic wrap and let sit in a warm place until doubled in size, about 2 hours. After the dough has risen, turn out onto a lightly floured work surface and, using a rolling pin, roll into a 12-inch by 18-inch rectangle. Make sure the dough is smooth and even. (this will ensure uniform baking and presentation. Pecan Topping: Combine all ½ cup butter, 1 cup brown sugar, 1 cup heavy cream, ½ cup cane syrup (Porier’s) and ¼ teaspoon salt in a small saucepan over medium heat. Stir until butter melts. Bring to a boil 3 minutes. Remove from heat and pour on top of 3 cups roasted pecan pieces. Set aside to rest until ready to use. Filling: Heat ⅔ cup cane syrup until simmering. Mount in ¼ cup butter by cutting the cold butter into cubes and adding to hot cane syrup a little at a time while whisking until all butter is incorporated and emulsified. (You only need to syrup hot enough to melt and emulsify the butter. If it is too hot the mixture will become greasy). Spread cane butter over dough. Top and spread evenly with 2½ cups boudin (loose or uncased). Tightly roll up the dough to form an 18-inch-long log. Cut into 12 even rolls. Arrange them in a buttered baking dish. Assembly: Cover the rolls very tightly with plastic wrap and allow to rise in a warm environment for about 45-60 minutes. Preheat the oven to 350 F. Bake rolls for 35 minutes or until golden brown. Remove from oven and allow to cool on a wire rack. Invert the pan onto a large serving platter and cover with warm topping. 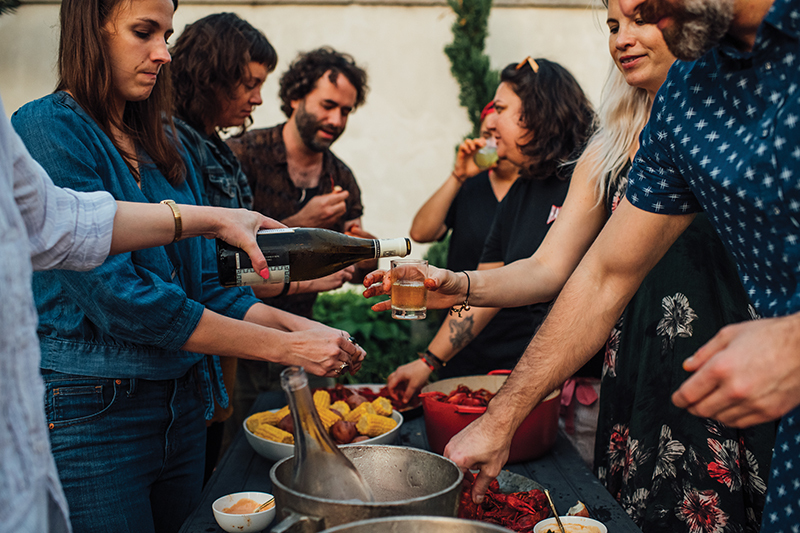 Note: Showing up to any gathering but especially a backyard boil with a magnum (equivalent of two standard 750ml bottles) will make you instantly popular. Les Terrasses Rosé: From Rhône, France this wine is a hot weather sipper featuring wonderful aromatics and funk with a sweet-tart, red fruit flavor and savory edge. Chateau Montus Madiran 2012: This dry white wine made in Southwest France from Petit Courbu and Petit Manseng grapes has soft floral and mineral notes and a freshness that pairs well with spicy foods. Fill an 80-quart stainless steel pot with basket half full of water and light the propane burner. Add ½ cup Zatarain’s liquid shrimp and crab boil concentrate. Add 5 pounds of small skin on new or red potatoes and bring to a boil slowly for 40 minutes. Add 2 pounds of corn on the cob (halved) or frozen cut pieces and boil for another 15 minutes. Drain vegetables – keep warm in a clean ice chest. Bring water back to a boil and add 35 pounds live crawfish (rinsed clean or purged*). Add ¼ pound of Zatarain’s crawfish, shrimp and crab boil powder seasoning. Bring the water back to a boil. Cook for 10 minutes or until the white tail meat or “knuckle” shows between where the head and tail connect. Drain crawfish using the basket and add to an empty ice chest. Dust with your favorite finishing seasoning with little to no salt added. Mix crawfish to coat – either using heat resistant gloves or by rocking the ice chest back and forth. Portion 1-2 ounces of mayo into small bowls (1 bowl per guest). Guests can mix in condiments to their individual taste. Suggested condiments for flavoring: ketchup, hot sauce, mustard, Cajun Power Garlic Sauce, horseradish, Worcestershire, salt, and pepper.